Marigold is a popular name among the flowers. There are two common types of marigold, African and French. It is widely grown in beds, pots rock gardens and as cut flower for making garlands, bouquets and also for worship. Many varieties of African marigold have been evolved which show variation in the height of plant, shape and size of flower. The height of plants ranges from 61-100 cm or more, colors are lemon yellow, golden yellow and orange and recently another color nearest to white is also available. Size of the flower may vary from 5 to 15 cm; carnation flowered type normally produces large flowers. Dwarf chrysanthemum flowered varieties are very useful for bedding. F1 hybrids are superior to the common varieties. French marigold is a popular flower throughout the world, having a wider range of color than the African type. It grows very easily, plant has dwarf, bushy growth (10 – 32 cm high) almost round in shape and bears large number of flowers of attractive color. The flower color may be yellow, golden, rusty red, mahogany, orange, deep-scarlet and often blotched, stripped or spotted in different colors. The heads may be single or double. 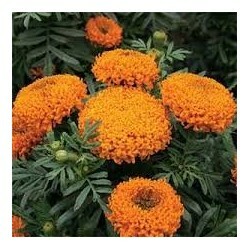 Although marigold can be grown throughout the year, mild winter is favorable for its growth and flowering. Hence, it is widely grown in the winter months in the plains and the seed are sown in September – October. In the hills, sowing is done in March – April. French marigold flowers profusely in porous soil, while growth and flowering in African type are better in rich and moist soil. Soil: Marigold grows in well-drained loamy and fertile soil. Water: Keep the soil moist and water before the soil completely dry out. Fertilizer: A good organic fertilizer at the time of planting is enough for better growth and flowering. Over fertilization may cause excess growth of foliage and poor flowering. Pests: The scent of marigold will help to repel animals and insects and using marigold extract as pesticide by home gardeners very long time. Diseases: Prone to bacterial leaf spot, powdery mildew, damping off, and root rot. Sowing Time: For the plains: August to October. For the hills: March to April.